Some weeks ago I made a comparison about Airbus and Boeing aircraft market forecasts. Last week I published a couple of posts about the evolution in the forecasted aircraft average size and on the accuracy of these market forecasts. For this, I looked for old issues of Boeing Current Market Outlook from as back as 1990. The forecasted world aircraft fleets by Boeing CMO (red line) from 2000 to 2031 (with some gap years). For 2015 to 2031 the forecast was made 20 years ahead; for 2010-13 it was made 15 years ahead; for 2005-2008, 10 years ahead and for 2000-2003, 5 years ahead. The published 20-year aircraft market forecast year by year. 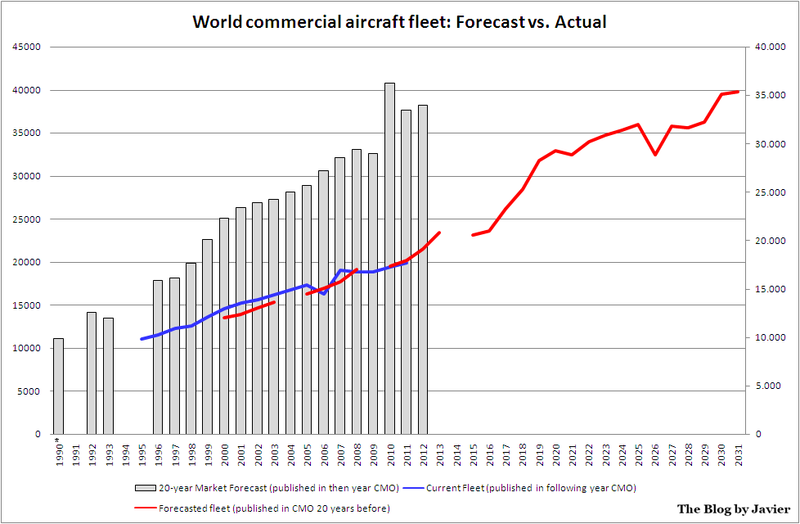 World commercial aircraft fleet: forecast vs. actual (data source: Boeing CMO). Actual fleet growth: 3.73% from 1995 to 2011 (2.88% from 2000 to 2011). Forecasted fleet growth: 3.55% from 2000 to 2031 (3.69% from 2000 to 2011). 20-year market forecast: 5.07% from 1992 to 2012 (3.43% from 2001 to 2012). It is interesting to see that in those years when there is both figures for actuals and forecasted fleets the figures are close (-3.3% average deviation) and so is the trend, though forecasted fleet was lower at the beginning of that period (-7.2% in 2000) and grew at a higher rate until almost matching the numbers in 2011 (+1.2%). Even though, the 20-year market forecasts have grown at a higher rate than fleets, it is mainly because the first data that I could retrieve come from the economic crisis of the beginning of the 1990’s, when Boeing trimmed down its forecasts. From the 2000’s the figures for market forecast have grown at a similar rate than those of fleets. And so will be the growth of forecasted fleet from 2011 to 2031: 3.5%. It would be interesting to have a per-segment graphic, however there is not consistent data to produce it for the same time span. Boeing changed singe-aisle cut-off seat size from 1999-2000, in 1996-1997 and 2008 didn’t report the split within twin-aisle, in 2008 it also didn’t report the split within single-aisle.